We know, it’s freezing outside, and the last thing you might think about is swimming in your pool come May of 2018, but existing eco-friendly pool owners may want to redesign existing features to get the most out of their pool. While swimming pools can be luxurious, many designs can make a pool more sustainable. Our pool professionals can best advise how installing or redesigning a swimming pool with eco-friendly materials and pool water treatment systems can benefit your backyard, as well as help preserve the environment. Many pool owners rely on chlorine to sanitize their swimming pools. But what some pool owners may not know is that chlorine must be handled and dispensed properly. Furthermore, excessive exposure to chlorine can be dangerous, as this powerful chemical has to potential to damage the structure of your swimming pool, pool accessories and even swimwear. More importantly, chlorine poses potential health risks such as irritating skin, eyes, respiratory system, and can lead to an increased risk of children developing allergies or asthma. After pool season, draining a chlorinated pool is toxic to local waterways, aquatic life, and animals. To avoid the negative effects of chlorine many environmentally conscious pool owners now choose to install green pool designs and practices. 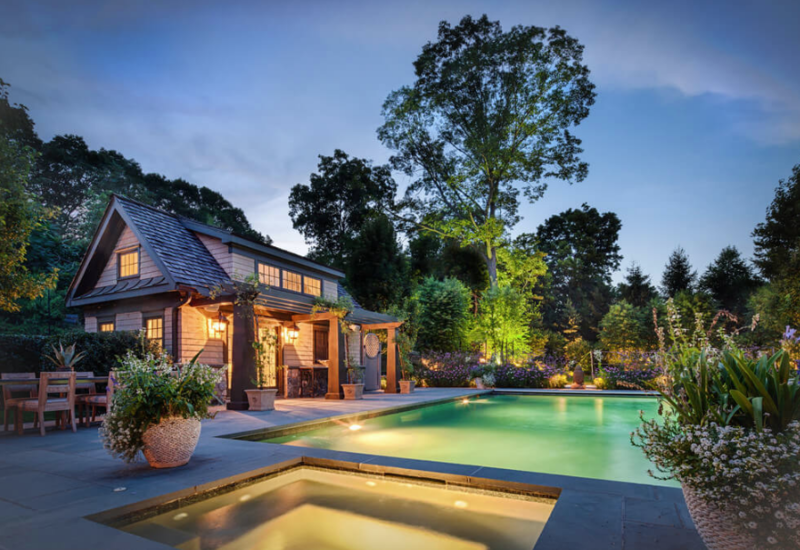 A natural swimming pool design closely resembles a pond or lake. Pool owners, who are looking to create a serene, organic, and aquatic plant-based pool can opt to install a natural swimming pool in their backyard. Natural pools are low maintenance, as this style design does not require harsh chemicals. As an affordable option, the materials used to install a natural pool are gravel and clay, as opposed to concrete or fiberglass. This unique design features sloping sides and includes an area dedicated to aquatic plants and an area free of plants, thereby allowing ample space for swimming. This style of pool houses a natural self-regulating ecosystem. Aquatic plants are the primary focus to maintain a natural pool, as purification from plants filtrates oxygen, support beneficial bacteria, and provides a natural habitat for aquatic life. Even better, natural pools require monthly maintenance by vacuuming loose sediment to keep the pool pristine and clean. Natural pools eliminate the need for chlorine, a filtration system, and pumps thereby significantly reducing maintenance costs. Which means pool owners don’t have to monitor chemical levels, pH levels, and minimal filters. Instead, they can spend more time enjoying their pool. Moreover, since natural pools mimic a pond, freezing until spring when the plant cycle begins, this eliminates the need to invest in a pool cover. Did you know that installing a moss-filtered pool water treatment system to your current swimming pool is eco-friendly and cost saving? Similar to natural pools, moss-filtered pools also decrease the need for harsh chemicals such as chlorine, cyanuric acid, and algaecide. Pool experts estimate moss pool water treatments use 40% fewer chemicals than that of traditional swimming pools. The moss water treatment system only requires dispensing the minimal amount of chemical needed to kill free-floating bacteria. Installing sphagnum moss chambers within the pool, the plant works to regulate biofilm and purify water quality. Another major benefit to installing moss-filtered pools is water preservation, at approximately 70%. With a moss filtered pool water treatment, pool owners will ‘back-wash’ less frequently, thus saving water. Moss is capable of filtering bacteria from pool water and can become compost upon replacing about every 30 days. For a more sustainable pool maintenance system, an ozone sterilization system uses ozonators and mineral purifiers to increase pool clarity and water quality. 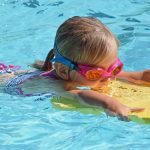 Ozone, referred to as tri-atomic oxygen, is a powerful compound that can effectively oxidize and sanitize pool killing pathogens and contaminants. Ozone pool water systems convert oxygen into bacteria-busting ozone using electricity, reducing the need for chemicals by nearly 80%. Pool owners will find Ozone to be safe, and that it will not irritate the skin or tarnish pool equipment. Also, there isn’t a noticeable odor, color, or taste. Pool owners will also discover that ozone can purify water close to 3000 times faster than traditional pool sanitizing chemicals, leaving no by-products except pure oxygen. Meanwhile, chlorine leaves a chemical by-product called hypochloric acid and additional salts in your pool water. As the awareness of climate change increases in 2018, pool owners find it more important than ever to be sustainable. 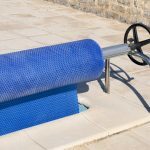 By investing in eco-friendly material for your pool, pool owners will reap the benefits from green opportunities that help to reduce chemical usage, common health issues, and maintain the environment. Are you considering installing an eco-friendly pool system or a redesign this upcoming season? Contact a leading tri-state pool and spa professional today to learn how you can do your part to preserve the environment right in your own backyard.